All of our members have been carefully selected and pre-screened. In many cases, we have been working with them for over ten years. We will make every effort to put you in touch with a dental accountant closest to your location. If we don’t have a member firm nearby and are not comfortable recommending someone, we will tell you upfront. The Dental Accounting Association is founded and managed by Build Your Firm, Inc., which is a practice development firm dedicated to the accounting industry. Build Your Firm has operated since 2003 and works with thousands of accounting firms throughout North America. Build Your Firm does not provide any accounting or tax services. How Are Dental CPA's Different? In a typical CPA firm, the practice works with all types of businesses, organization, and individuals. As a result, dentists represent a very thin portion of their overall practice because the firm works with everything from construction to retail to non-profits to manufacturing. This means most local CPA's would not know an Endodontist from a Periodontist, let alone what CAD/CAM dentistry means. By hiring a Dental Certified Public Accountant (CPA) that provides a boutique level of expertise, not only will you have a sound financial system with excellent reporting, you'll have a trusted advisor to make better-informed business decisions. in fact, Dental CPA integrated dental specific financial management software along with industry-specific reporting to make superior decisions. And, a Dental CPA also has peers around the country to canvass for extremely rare situations. While our dental accountants are CPA’s as well, the size of our member firms is closer to the size of your dental practice. That’s why our fees are more reasonable and well understood in advance, rather than billed hourly. Typically, our members are sole CPA practitioners and occasionally, 2-4 partner CPA Firms with a staff of less than ten. Our dental accountants focus on all types of dentists but often service doctors as well. And, our dental accountants tend to be younger and more tech-savvy than large established CPA Firms. At the larger CPA Firms that service hundreds and hundreds of dentists, you feel like a number rather than a valued personal client because staff sizes are huge and typically cater to the larger dental practices, MSO’s, and DSO’s that can easily justify higher professional fees billed hourly. What Types of Dentists do members service? Our members also serve future dental practice owners under our new dentists program. This program is designed for dentists who are independent contractors, dentists in residency programs, and dental school students. 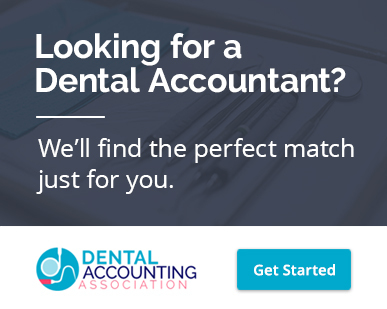 If you are a CPA Firm with a dental specialty and would like to become part of the Dental Accounting Association, complete a simple form and we will get back to you.